← BRING YOUR KIDS TO OUR SCHOOL HOLIDAY ART-VENTURE CAMP!!! REGISTER NOW!! This course suits those who want to start a part time business with small investment, kindergarten owners who want to add value to your center or even stay home moms who wants to start a playgroup or homeschooling their kids. But above all, you must have passions in kids & teaching, love arts & crafts and optimistic. 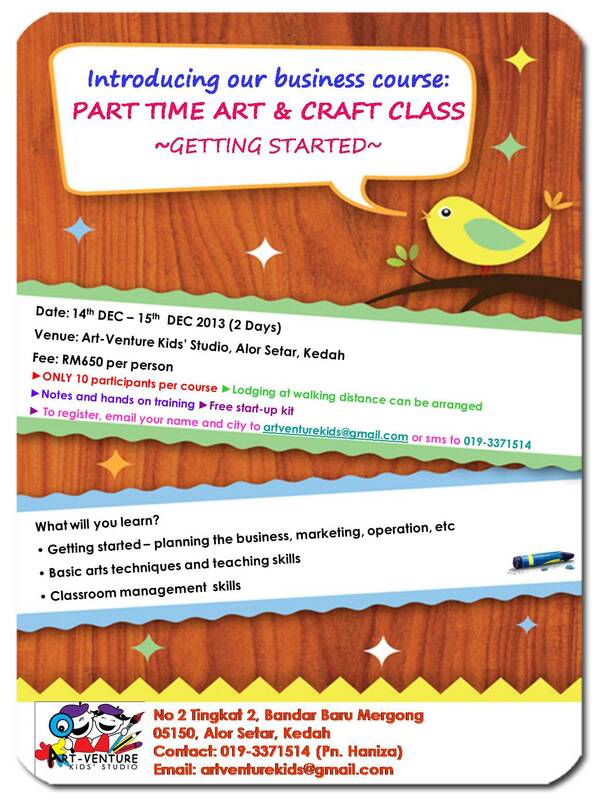 Posted on December 4, 2013 by artventurekids	• This entry was posted in Art Class, Event and tagged Business course, kursus business dari rumah, kursus business secara part time, part time business. Bookmark the permalink.